Just over a week before the fourth generation iPhone is expected to debut at Apple's WWDC, prototype screen components of the new model have reportedly appeared, this time in the Czech Republic. According to a report by SuperiPhone.cz, the next iPhone will sport a high resolution screen using conventional IPS LCD technology similar to iPad. 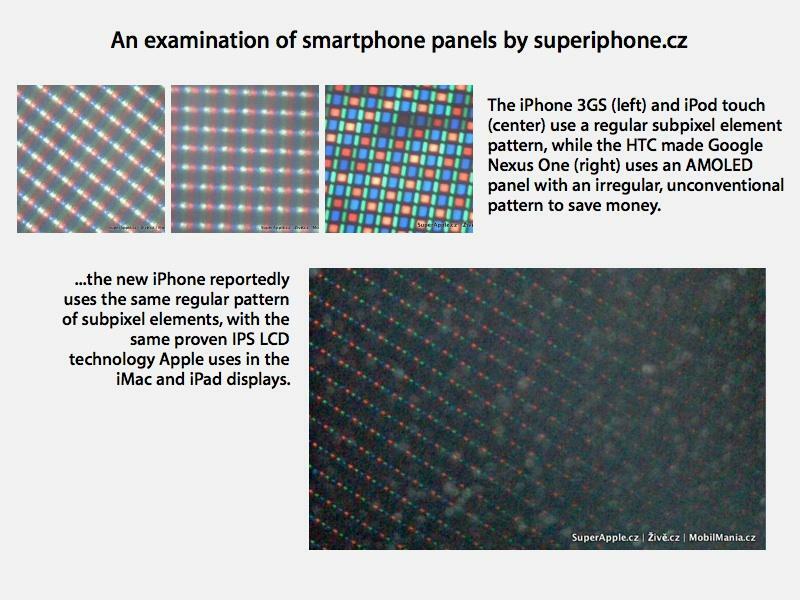 The Czech site reported on a screen component it says will be used on the new iPhone, detailing its specifications under a microscope. It compared the high resolution new iPhone panel and its "amazing" 320 pixel per inch display against the existing HTC HD2 (217 ppi), the Verizon/Motorola Droid (265 ppi) and Google's Nexus One (252 pip). Unlike the AMOLED panel used by Google's Nexus One, the iPhone's new screen will feature the same regular, uniform grid of red, green and blue display elements. The Nexus One's screen uses a "PenTile" grid, reportedly to reduce costs, which packs smaller green pixel components between red and blue elements. This irregular arrangement of subpixel elements results in the Nexus One providing a less accurate display of lines on the screen. The IPS screen technology Apple uses (from the iMac to the iPad) provides wide viewing angles, a more accurate color gamut, and fewer potential problems in production. OLED screens are plagued with manufacturing issues, production is constrained, and nobody is manufacturing the screens in large numbers. At a reported 960 x 640 resolution, the new display will make it easy for the new model to render existing iPhone apps via pixel doubling, while also giving Apple bragging rights to the highest pixel density on a mainstream smartphone screen. Apps can also be optimized to take advantage of the new resolution, much the same way that existing iPhone apps can be adapted to support the iPad's higher resolution, while being distributed from the App Store as a single package that can run on any phone. Developers on other platforms have a more complicated task of adapting their apps to work optimally on a variety of different resolutions, and may be less likely to choose to support less higher resolutions due to aiming at the lowest common denominator specifications. Apple's control over the iTunes App Store experience makes it easier for the company to incentivize developers to support its latest hardware technologies and promote those advances to users so they are interested in paying for them.